This week focus on all aspects of healing. The beginning asks you to be the ultimate authority in your life, as you pull in all your resources to be balanced. The middle asks for patience and shows growth as you care for every aspect of yourself. The weekend is a good time to be alone and focus on relying on yourself, rather than trying to control the others around you. Let go of outcomes and enjoy the journey during this empowering week! Happy Holidays this month as we are focused on being our ideal selves! The month shouts “moving forward” in a positive way. There will be lots of worries floating around this month, so its important to stay focused on what motivates you and brings you joy. You might encounter helpful beings this month, and the joy of creative projects and activities. By the end of the month, things that have held you back will be over as you move forward quickly and close yet another year. “There is a great disturbance in the force”~The Emperor, The Empire Strikes Back. Preach, Emperor; there really is a ”great disturbance”, or rather, a colossal ripple effect in the energy of our planet. In the last few years we’ve seen an amazing number of social and political rebellions on both a major and minor scale. Whatever is happening in the world, keep in mind that these are signs of awakening. Awakening starts with the feelings on an individual and collective level that something is not right. We experience the sense that there is a better way, and we are exploring being unsatisfied and restless. While many of these changes are being pushed through with heartbreaking and seemingly extreme results, we can understand on an energetic level that a shift is taking place. Whenever there are shifts, it manifests as physical deconstruction well before a new type of construction takes place. Here we have December, our last month of 2014, and this month we are asked to reconcile with these restless feelings; we must come to terms with this ”disturbance.” As you focus on your personal life this month, which will be more prominent than the months before, you are encouraged to make peace with everything that disrupts your peace. The Ascended Master Pallas Athena comes forth this month to deliver a message for all of us. I saw Athena as dark-skinned with long, braided brown hair and deep brown eyes. She wore an amazing red-orange dress and her presence was strong and unmovable. She is best known as the ancient Greek goddess of war and wisdom, arts and crafts and the household. She helps with resolving conflict, protection of physical and psychic levels, creativity, and honesty and integrity. 1) Move forward with integrity; will you be able to look back on your actions and feel satisfied with your movement? 2) Everything is energy; you can feel this energy, manipulate it, mold it. Start with energy first when trying to change, manifest or understand situations. 3) Time to bring your true feelings to the surface; too much has been repressed and hidden for too long, mainly from yourself. Don’t be ashamed or feel guilty about these feelings. Let all buried feelings about anything rise to the surface and be felt, so you can release so you can move forward. 4) Many traditions are upon us this month, but for some it will feel different as it never has before; accept the difference, as it is a part of growth and change. 5) Don’t force yourself to do anything this month when it comes to connecting with people; its okay to break away from the crowd and work on your relationship with yourself. 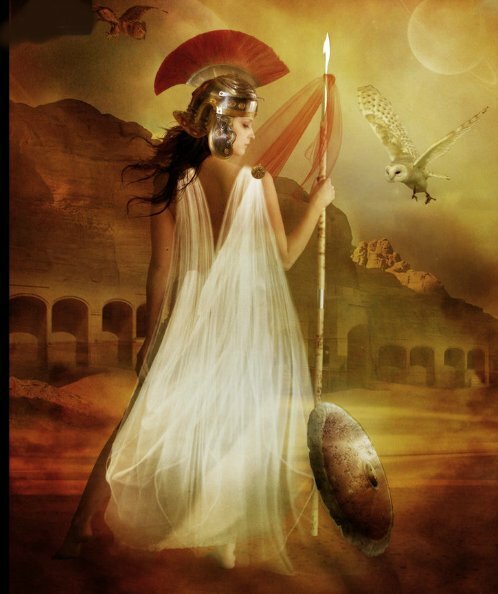 Greetings, I am Athena, protector and guide of human energy and beyond! I am honored to join you, as I work with you to realize your true selves. As you have observed, much is rising to the surface as of late; this is due to the need for change. Everyone is restless; this is because you have realized something that is beyond your physical bodies, but your consciousness keeps fighting it. An outpouring of emotions with high intensity are the result. Do not fear this; this is all part of your evolvement. This month energies will still be high and intense, but with an ability to step back and reflect. Use this month as an opportunity to see why you are mad, depressed, unhappy, dissatisfied or any other ‘negative’ feelings you are experiencing. Do not press for the answers all at once, but allow them to come to you slowly through prayer, meditation, writing and other quiet activities that allow you to connect with yourself. Something that will help you is to pay attention to your sacral chakra and engage in creative passions and pursuits. If you sit around waiting for inspiration to come without feeding that energy center, it will starve to death. Working with your hands will be extremely beneficial, as it will help fuel your creative passions and help you to connect to your divine self on a deeper and more intimate level. You’ve been ignoring it for too long, wondering what is the point on spending time on that which you love? You are worried too much of the outcome; get back to enjoying the process. Protect yourself from harsh people this month; they will see your brilliant light and unknowingly feed off your energy. You heal the world best when you are healing yourself. Remember we work together. Call on me for wisdom, advice and protection. I am here for you. This week’s card reading is focused on the aspect of SELF-LOVE. You might be feeling spent lately, and that is because so much of your energy is being directed outward; now its time to bring it inward and focus on your own Divine love. The beginning of the week might feel harsh, so loving yourself and caring for yourself is essential! The middle of the week sees you are called to change things up a bit for the best result. The weekend looks very happy and content, and you can optimize this by letting go of worrying about the outcome and just keep taking care of YOU. This week you might encounter many things at once on the physical and spiritual level. The key here is to stay centered within yourself and pay attention to your inner guidance. Ask the universe, “What can I do for my highest good?” You might be tired this week, so take good care of yourself and rest. This weekend you will have a chance to make new intentions and have a new beginning. Remember YOU are the master, so if you want things to change, only YOU can change them. Use the waning moon energy this week to help you let go and let God. Trust your inner guidance and your natural ability to be powerful. Let go of any past feelings of regret, anger, hurt, guilt or otherwise to help you move forward. You CAN rely on yourself! Solutions will appear for you when you start seeing yourself in a more loving light, and when you do this, the weekend shows that positive results will manifest! This month you basically take a huge BATH. Its all about looking around you and deciding what helps you move forward, and what holds you back! You bring a lot of balance into your life, which helps you move forward. Your guidance is to LET GO of that which no longer serves you; this includes people, habits, attitudes and beliefs. By the end of the month, you’ll be empowered to create a better and more fulfilling life. This week we get to ”pick up the pieces” of our spiritual selves. Stay true to who you are the beginning of the week and don’t back down for anybody! The middle of the week asks you to reexamine your beliefs and attitude about a situation that you feel is holding you back. By the weekend, you will have accomplished something and feel you are going in the ‘right’ direction. All week long connect with who you TRULY are; a spiritual being.